Staburags Special is a light beer, brewed from 100% bio hops*. Staburags Special beer prides itself on a beautiful golden colour and a delightful freshness. It has a moderately sweet, well-rounded bready aroma that combines with a pleasant malty flavour. It carries medium notes of biologically grown hops. This beer is gluten free. 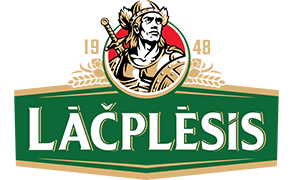 A masterpiece of the Lāčplēsis brewers. A beer wherein its rich flavour reflects both the beauty of the Staburags cliff, as well as the freshness of its springs. *Quantity of Bio hops - 0,24% of all dry ingredients. LT-EKO-001. 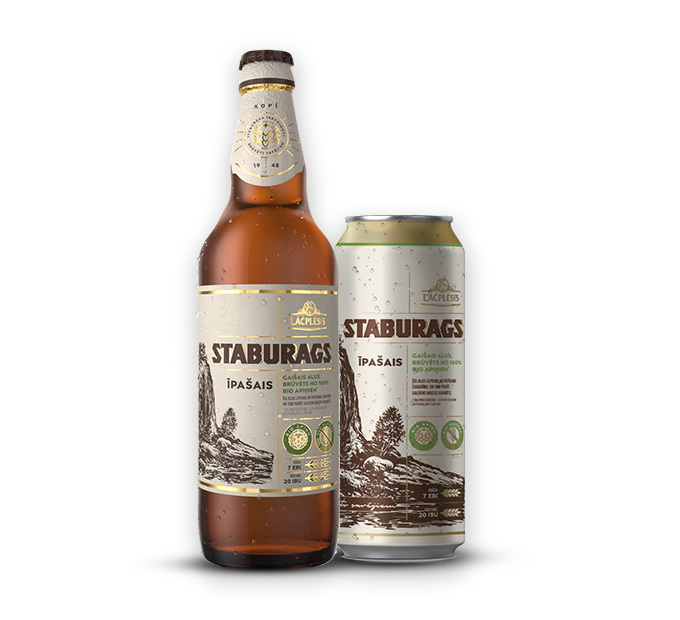 Staburags lager beer is intricately brewed following traditional Latvian recipes, using top-quality ingredients. It gleams with scarlet gold shades, and its taste features a slight touch of bitterness to complement the honeysweet flavours of the noble Munich malt. This beer evokes the thoughts of the Sun rising above the bluff riversides of Daugava and the unforgettable sight of the Staburags Cliff. 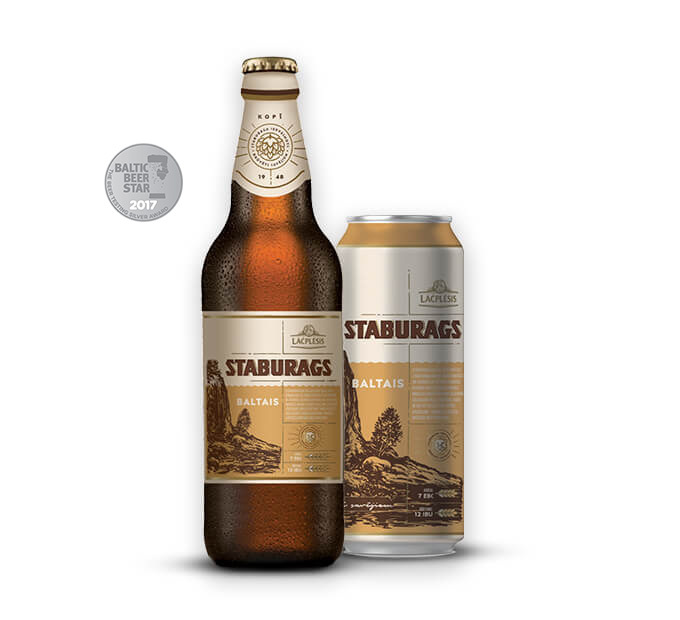 Staburags dark beer is brewed following traditional Latvian recipes, using top-quality ingredients. It gleams with deep shades of black, and its flavour bears prominent notes of burnt malt. Its thick honeysweet taste is complemented by the bitterness of fried malt. Dark like a deep night above the waters of River Daugava, this beer reminds us of the wealth of our nature, including the unforgettable Staburags Cliff. 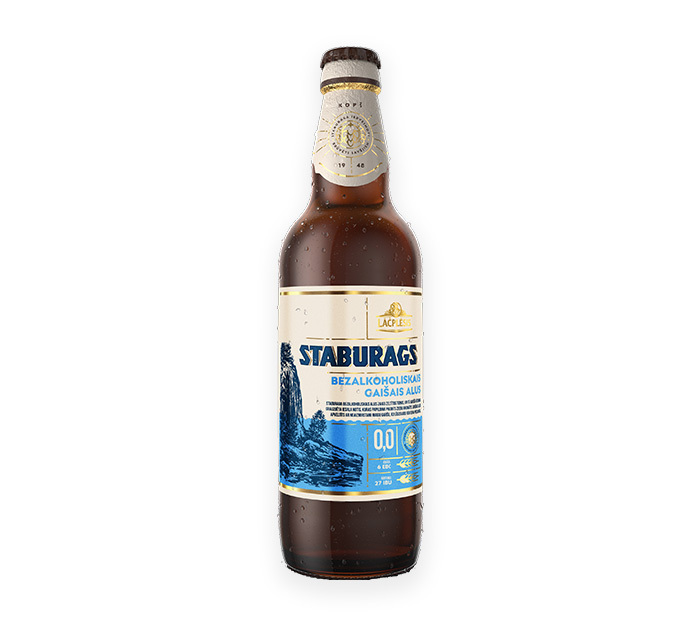 The Staburags white beer drink is intricately produced using wheat beer, brewed in accordance with traditional recipes, and other ingredients of utmost quality. It opalesces with smoky golden shades, and its flavour is special for the tempting scents of peach and citrus fruits. The fruity sweetness in the soft taste of this drink is balanced by a slight touch of bitterness, turning this drink into a true elixir of freshness and enjoyment. Like the first gale of spring along the riverside of Daugava, it reminds us of the unique treasures of our nature, including the memorable Staburags Cliff. A masterpiece of Lāčplēsis brewery, Staburags Kriek beer is a total surprise in the range of classical tastes. This is a beer of a strong character. 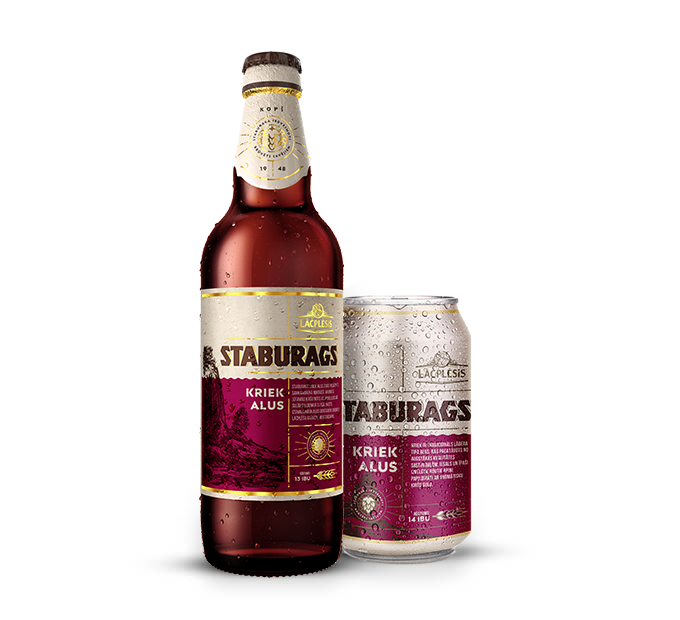 Staburags Kriek beer boasts a rich reddish-brown colour. The notes of cherry in its aroma also come through in its juicy sweetish flavour. Made for conoisseurs of refined beer. Premium beer brewed from pure barley malt and noble Spalter Select aroma and Brewer’s Gold bitter hops. Distinguished by a colour of pure gold, a strong foam head and rich aroma and flavour. We would not be lying if we called it the pride of our brewery. 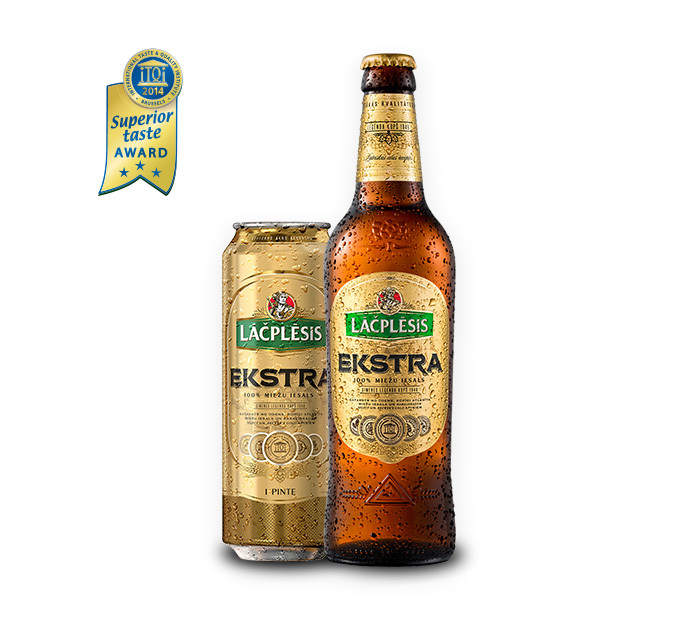 In 2014 was awarded the Superior Taste title by the International Quality Institute in Brussels. Contains 5.4% alcohol, available in 0,5L cans and glass bottles. This beer is the result of special recipe and craftsmanship. Caramel malt „CaraAmber“ awards this beer with rich golden color and light sweetness, while the mix of aromatic hops „El Dorado“, „Brewer‘s Gold“ and „Select“ grants the exclusive aroma. However, time is what magically enriches this beer and makes it truely unique. 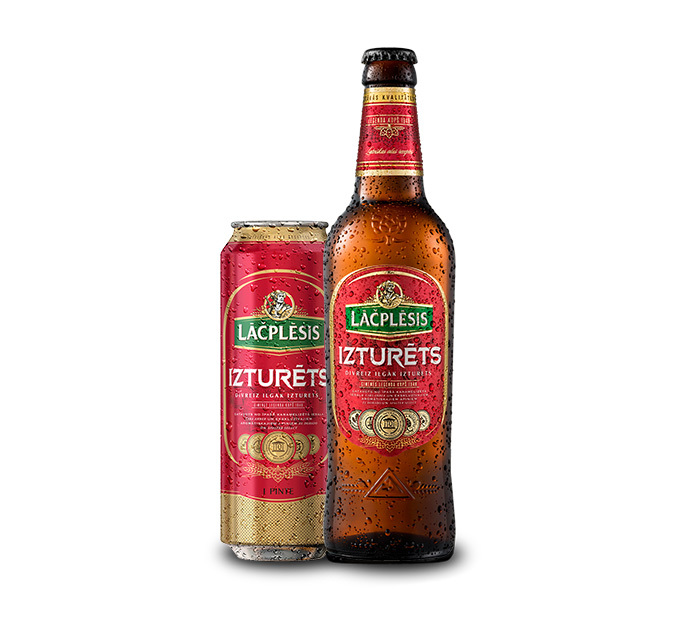 Instead of usual for lagerstwo weeks maturation, Lacplesis Izturets is given four. Additional maturation turns this beer to incredibly rich and unforgettable smooth taste experience. 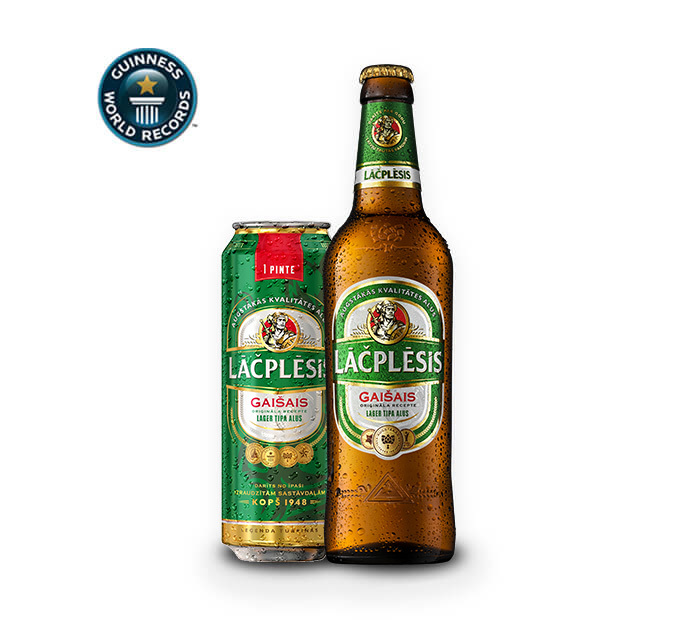 Thanks to its balanced flavour, golden colour and delightfully light aroma, Gaišais can take pride in being our most popular beer. Brewed using bitter Magnum hops and barley malt. Contains 5.0% alcohol, available in 0,568L cans, 0,5L glass bottles, as well as 1,5L PET bottles. There is nothing the glimmering amber colour of this beer could be mistaken for – obtained through the use of caramel malt. Characterized by a light yet distinct flavour and aroma – small wonder this is one our most popular beers. In 2014 gained the recognition of international beer experts at the World Beer Cup in the USA, bringing home bronze despite competing against 5000 other beers, as well as taking gold at prestigious European Beer Star competition in Munich, Germany among more than 1600 competitors. Brewed using barley malt and dual use Perle and bitter Magnum hops. Contains 4.8% alcohol, available in 0,568L cans, 0,5L glass bottles, as well as 1,5L PET bottles. It is Dižalus that can proudly call itself our strongest beer. However, a carefully selected malt body combined with bitter Magnum hops allows us to create a balanced taste and aroma. That is why this beer is still refreshing and easy to drink. Contains 7,3 % alcohol, available in 0,5L cans. 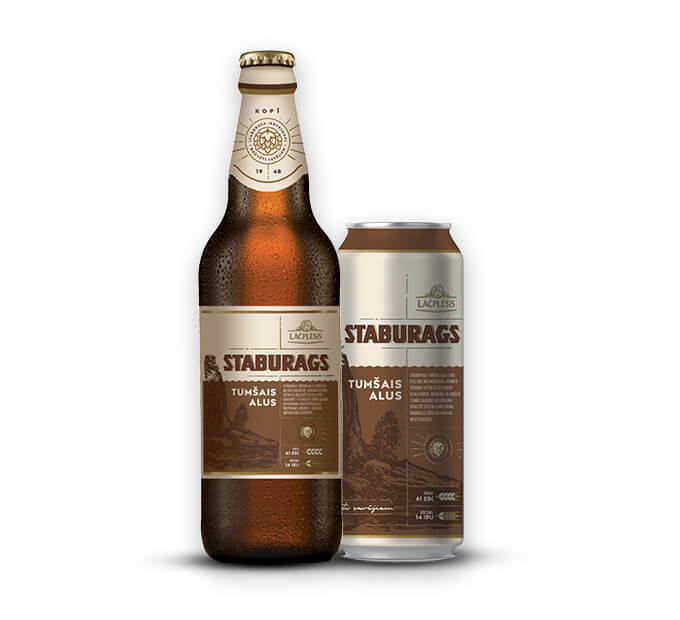 Staburags non-alcoholic beer shimmers in tones of gold and its flavour denotes nuances of roasted malt, supplemented by a spicy flower aroma. This light beer has an unforgettably smooth palate, balanced by a bitter finish. 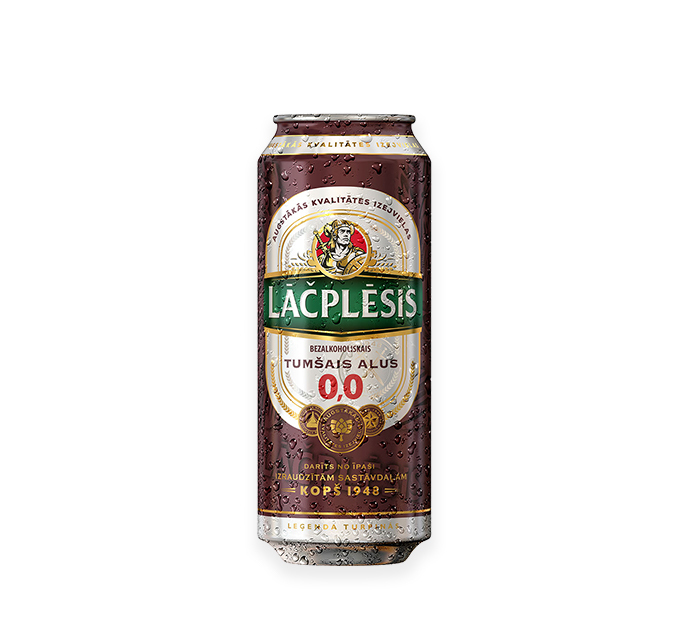 To make the taste of this beer, our tribute to the Staburags cliff, available to everyone at any time, the Lāčplēsis brewers created a Staburags that contains no alcohol. 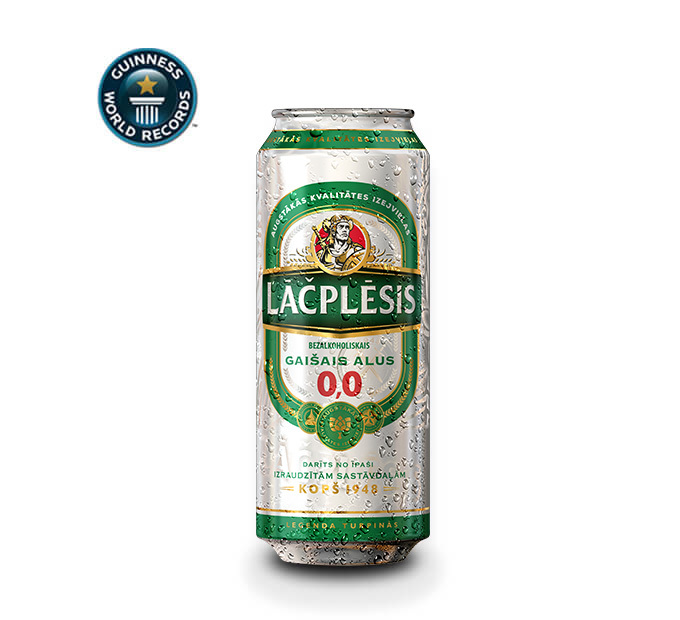 A non-alcoholic masterpiece from the Lāčplēsis brewers. Authentic light beer taste and a balanced malt and hop aroma, characterized by a clear gold colour, while containing 0% alcohol. A special brewing technique, using a balanced blend of barley malt and bitter Magnum hops, allows us to create a beer fit for every occasion. Available in 0,5L cans. A non-alcoholic beer with perfectly balanced shades of taste, created specially for the connoisseurs of dark beer. 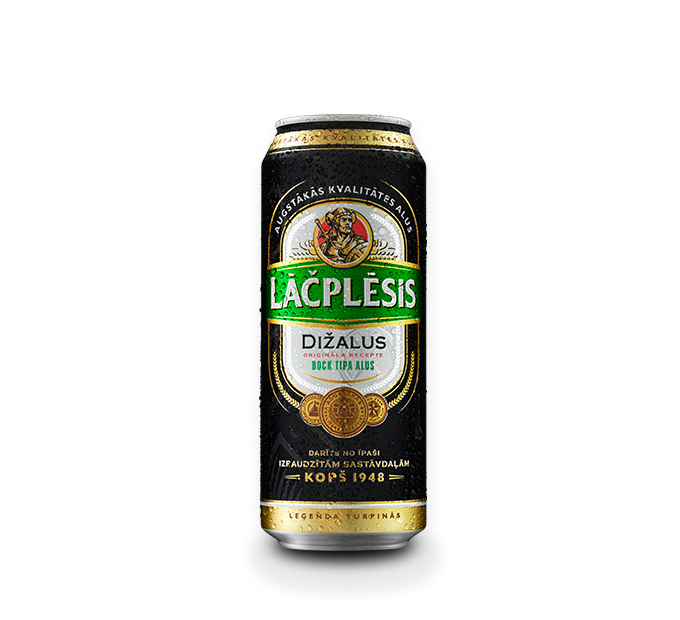 Lāčplēsis dark non-alcoholic beer is an innovation on the nonalcoholic beer market. Containing 0% of alcohol, this beer offers a perfectly flavourful taste of dark beer. Supplied in tin cans of 0.5 L.
Alcohol consumption is harmful to your health. Sale, supply and giving alcohol to under-aged is illegal.